Males of our new species have splotches instead of spots and stripes: all of their secondary color is contiguous. Sorry I didn’t manage to wedge “Saltywater Sally” Kerezi back in there. She’s regrouping. because she didn’t want to be backed against a wall like our villains are. Thank you! It’s one of my favorite things I’ve ever drawn for the comic, for the same reasons. This, so much of this. Hit the nail on the head there, Dac. Also, I seem to have made a few backrounds for that transparency, but I am not sure whether to use imgur or something else…. On another note, I learned a quarter of photoshop in three hours! …You guys are so great. I need to give you guys exploitable images more often. Oh hey thanks, I thought they would be too cheesy. I overthink things too much. Haha, I love the last one. Might make that my wallpaper. 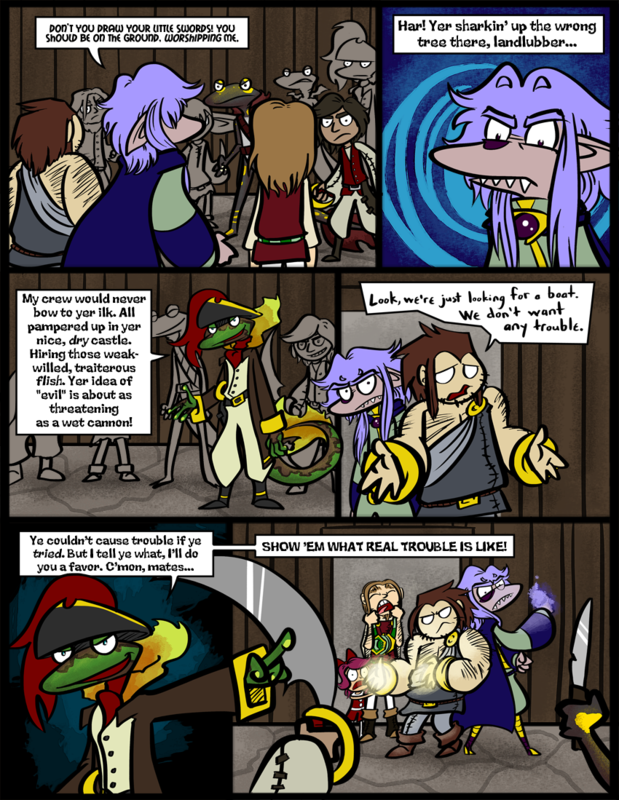 What a cool green lizard pirate! Seriously, his outfit’s awesome, I like it. Still really curious about unnamed species! More will be revealed in time! Ha HA! Finally, Skærva gets to show us how awesome he is. Usually he’s an amazing planner who just gets thwarted by Blank at the last minute, and his loss to the champion of the gods is just assumed by now, but it will be amazing to see him in action in a fight where the outcome isn’t guaranteed by divine blessing. Also, Light Magic and Dark Magic. Is there actually a difference between the two, or is it just a thing that makes you have to double up on resistances? Firing a bolt of light, firing a bolt of dark, it so far looks like both kinds have the same functions. Maybe a ‘don’t cross the streams’ kind of thing? Use the bard as a shield! They don’t want to hurt the accordion! So salamanders are aquatic? No, because the Flish developed in isolation. What’s this guy talking about? Not even the underwater Flish think of the on-land ones as traitors. Unless this is one of those ‘good’ pirate ships? It would explain why they haven’t been bowing to Skærva. I’m sure if he could manage it, Skærva would make his castle into a water dungeon. Wait, would that be possible? As for the magic, that’s really Victor’s pride and joy so I’ll let him handle this if he wants. Although the difference between light and dark magic (and healing, the third branch which is quite neutral) is a topic I’ve considered having an encyclopedia entry on, so we might wait and tell you then! These guys are aquatic, but they developed in an around the sea whereas the flish were masters of the rivers and lakes, thus they didn’t interact much. The bad blood is relatively recent. It might be possible, but because of logistical reasons of the castle being where he and his minions live and work, and water temples purposefully designed to be as annoying as possible to get around, it’s not quite worth it. You know, now that you mention it, we really haven’t seen these salamanders anywhere else but here . . . and I don’t see any flish in the room. I find that interesting; the two species don’t get along then? And that is recent? Oooo history lesson in the future . . .
B-the energies will combine, causing the two opposing magical energies to become a THIRD type of energy-either magical energy, “real” energy, (AKA kinetic, electrical, et cetera,) or a combination of the two-which could, theoretically, depending on the magic system and such, either cause an explosion where they meet, or just become a NEW magical projectile. D-it would require him to be touching Cyril in a situation where it can be avoid AT ALL. If Skarva made his castle into a water dungeon, he would quite possibly get in trouble with his minions always being wet, and the Third, Second, and FIRST quite possibly being unhappy that their current heir kind of ruined their home. …OK, the Second wouldn’t probably care about the house ITSELF, but that means that HIS PRECIOUS BOOKS WOULD GET WET. Not to mention how terrible the dampness would be to his hair. Dagnabbit, that was meant as a reply. 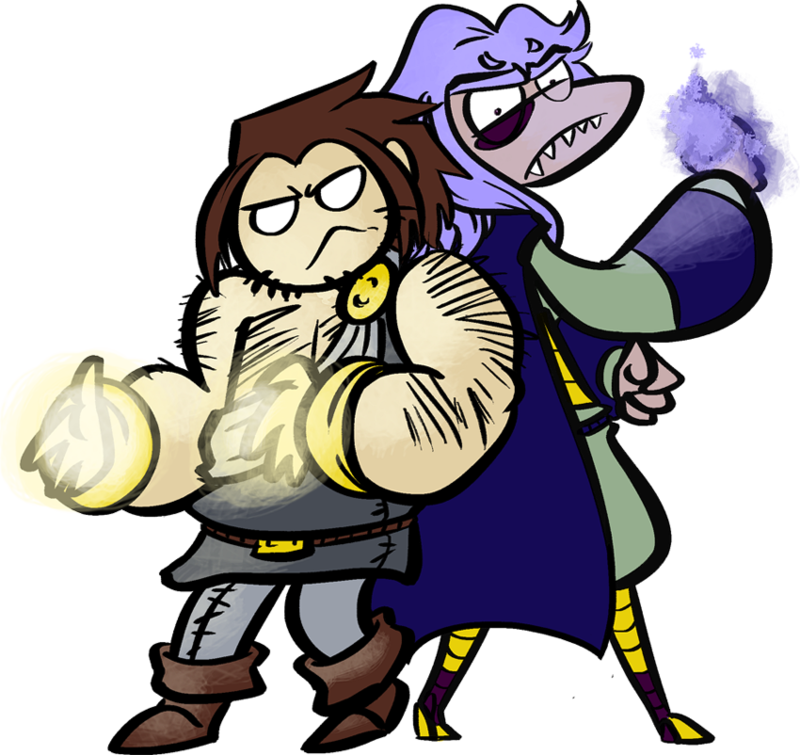 Light magic generally has the advantage over dark magic, so with two users of equal relative skill, the light would probably banish the dark. But if the dark user was more powerful, they could neutralize. Yeah, ever since the whole “uses little girl to obtain lunch” debacle, he really couldn’t bear any more bad press. The tabloids would be all over that. Haha, being a ghost, I don’t think the Second has to worry about his hair. But they would be upset about the castle, no doubt! The Third was totally into the shark thing, and not even he would take it that far. F yeah! Back to Back Badasses is going up on the trope page! This page is epic in so many ways, and the fighting hasn’t even started yet. The freaking Yin-Yang duo here, back to back, fighting off pirates! How could this be any cooler?! Aw, someone beat me to the tropes page. That’s what I get for missing my midnight check. Also, these pirates are racist. That’s the true reason they must be fought. Between this, a new 3DS Zelda, Earthbound being announced for Wii U VC, new Yoshi’s Island, and classes being cancelled/replaced with a guest lecture, this has been a great morning. Yaaay! New tropes! Happy morning indeed! Lame, shark-related insult! OH SNAP. I love that Skärva is leaning into Derk slightly; he actually looks willing to protect him. It’s rare and awesome when Skärva does these altruistic things! I’m excited to see how he manages to mess this up and make himself still seem like a selfish brat. And Cyril needs to calm down. The pirates aren’t going to hurt HIM, HE’S the one with the accordion! Or they might just attack him anyway. You never know with pirates. “Oh Snap” is the sound of Skärva’s sharkface biting this guy’s head off. Oooh! The panels are evidently not capable to hold all the awesomeness of Skarva inside them–look! Skarva AND the cool Captain lizard are both popping out of the lines! Oh, I missed a few days. Hellooo salamanders! Also sharkpuns. I dunno if it was intentional or not but I find it hilarious that even though they’re back to back, Skarva is facing the -exit-. AHAHAHA! Not intentional, but one of those poetic accidents of the universe. BEAT THEM UP SKARVA! WIPE THE FLOOR WITH THEM DERK! SHOW THEM WHO’S BOSS! They’ll try not to disappoint… and so will I! BOO YEAH, SIC ‘EM BOYS!
. . . And by “boys” I mean Derk and Skaerva, obviously. Sorry pirates; you’re cool, but you’re also going down I think. I really like the design of Salamander Captain there. Seriously cool. Will look better after a good thrashing though, hehe. I also like how Derk was trying to diffuse the situation. Now if the pirates get their peg legs handed to them, its going to be their own dang fault. Apparently Skaerva needs to get to sea more often; more of a presence may prevent such terrible welcomes in the future, lol. Also, this page is so much win. Just all over. Fun fact, when I was researching salamanders, I learned that they can regrow missing limbs and tails!! So no peglegs here (well, maybe only temporary ones). The Shark Who Never Went to Sea. How poetic. A cautionary tale. Are we going to have an encyclopedia page on our new salamander species? Love to comic, especially that last panel. Apparently captcha thinks the situation is getting fevered. Bubbles, you evolved! When did that happen? Hey doesn’t skärva still have that shield, or is that just a final boss thing? Anyway, there are some spells that take a certain amount of preparation, both intense mental concentration and other rituals, so he can’t just pull out something that impressive whenever he wants. That would make life pretty easy!